April is National Gardening Month. (Who makes up these things?) It is the month when we scurry around between rain showers, trying to get everything done while being in a near panic over the explosion of grass and weeds happening right before our very eyes. I would like to proclaim April as Gardening Overwhelm Month. Seems like everyone is coming out with To-Do Lists on what you should be doing at this time of year if you had your act together (which is making this overachiever, for one, feel like a real slacker). One of my favorites is from Erica at NW Edible Life. I won’t try to duplicate her post here (or even keep up with her!) The reality is, however, what we accomplish now will save us a ton of backbreaking work later. What is truly feasible? How to find a balance? Taking an April Garden Survey is a good initial procrastination technique. The idea is to walk around and make a list of things you need to do. I’m great at making To-Do Lists. To make it easier (or more complicated, depending on your perspective), I like to divide my To-Do List into categories, for instance, Now, Soon, and Later. 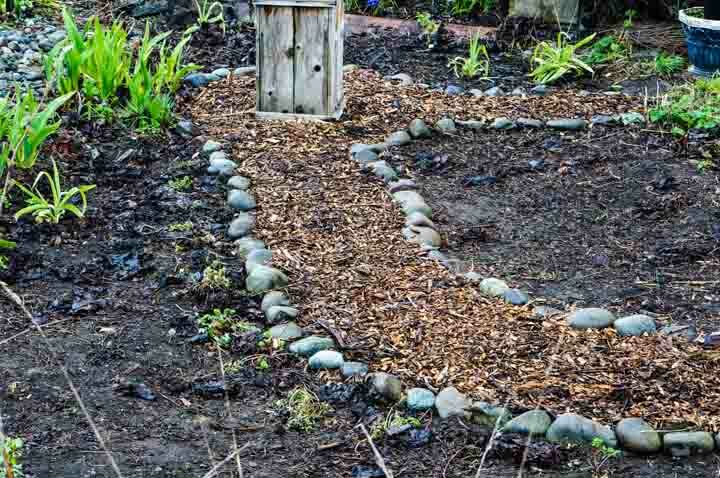 In this case, under the Now, I made subheadings of Plant, Prune, Mulch, and Clean-up. That alone provides enough tasks to dribble on over into May and June. Keep in mind, however, my main goal this year is to figure out how to DECREASE (not increase) my workload. After all, I’d like to take a few hikes this year, not just work in the garden. A key part of my strategy is to focus on optimizing what is already here. In some cases, that might mean cleaning out; in others, it might mean filling in. Because April is one of our main rain-accumulation months, things have to be done while the ground is not too soggy but still damp enough to make weed pulling easy. We can do this! We start with veggies because that is what everyone is talking about. For me, I have decided to cut back on the annual veggies. They are just so needy. They beg to be pampered. You can’t leave them. You become their slaves. And for what? For that luscious experience of biting into a fully ripened tomato picked right off the vine and of feeling the juices drip down your chin… Alright. Alright. So I’m growing a few tomatoes, but not a dozen varieties. 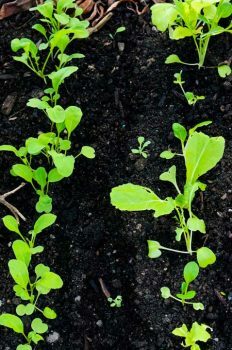 And yes, a small salad garden to go with it is a must, and of course a few peas and beans. And don’t forget squashes, which I have to grow because I save the Malabar squash seed every year that originally came from a very kind older gentleman from China. And last year pretty much sold me on the Lower Salmon River squash from Bountiful Gardens, which is no longer in business (and we miss you). So, Ok, that’s beginning to sound like a lot; so yes, I still follow the advice of what to start when according to our predicted last frost dates. But I don’t have a designated plot for them. I plant them here and there among the shrubs, herbs, and flowers. Wherever I can tuck them in. 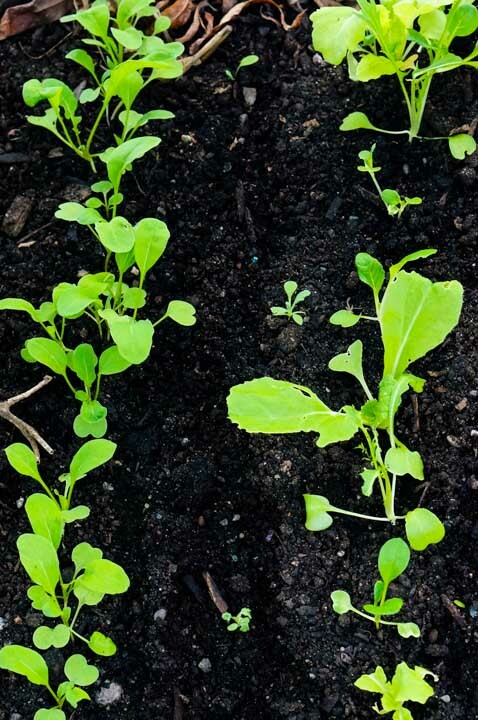 And even though the back acre is miraculously full of kale and mustards gone feral, so we’re certainly not going to go hungry, I still prefer to buy many of our veggies from the young farmers down the road who are working very hard to try to make a living at it. Last year, I took full advantage of the Solexx Greenhouse (kits on sale until April 15!) and grew a lot of perennials from cuttings. I thought about having a plant sale, but as time went on, it didn’t happen. So then I thought, what the heck, why not just plant everything. Only it’s a LOT of plants! (Yes, contact me if you are interested in what I might have left). This is the perfect time for transplanting, and so I will be getting more of those currants, gooseberries, aronias, and associates in the ground. Where, exactly, I’m not sure, which is why my walk-about garden survey is so important. ahm. The apples and grapes were pruned in January – February. 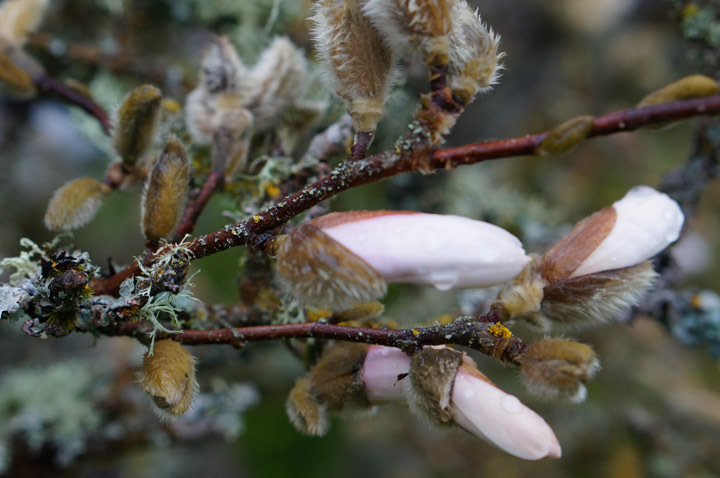 The March – April focus is on the cane fruits, willows, and some of the shrubs. The herbs could all use a little trimming up. The willows, in particular, have been a bit more of a challenge because I skipped them last year. If anyone would like rods for fence building, sculpting, basketry, or planting – contact me. We have plenty. I am considering buying a chipper. This is the catch-all phrase that I use for everything else. We planted our garden in the middle of a cow pasture. What did we expect? Grass is everywhere. Cardboard and deep mulch doesn’t seem to suppress it. I have learned to appreciate the chaos for how it supports insects, birds, and bees, and then tackle those areas that are crying the loudest for help against invasive thugs. I use a scythe (tell Alexander I sent you) in the big open areas or, in close-up spots, what I call a lavender sickle, which is basically a curved serrated blade on a handle like the one pictured in the link (yes, for the record, I’m an Amazon affiliate, but don’t let that stop you from buying from your local garden & hardware store; local is best). This tool is pretty indispensable, in my book. This garden area is always such a mess! Maybe this year it will be better. I spent 3 days with a Magna Grecia hoe, (also available at Scytheworks), ripping out enough morning glory to go around the world several times, in an attempt to transform this little area (which is located right next to our house) into something that will possibly not be such an eyesore. It could definitely be a Zone 1 garden area, meaning, one that you frequent every day. Everything I have planted here has failed. It gets a lot of shade from the house. The wild blackberries have somehow found their way in. We dug the area up last summer when a water pipe broke. Now there is a pathway to mark those areas where I dare not plant (that wooden box is over the well pump, which might need to be replaced). I figured I would plant easy things here for now, just to see how strongly the morning glory returns. I spread out some lilies, irises, and salad burnet. 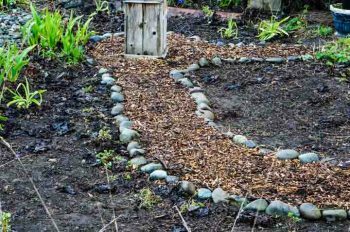 Over the bare areas, I threw out a bunch of poppy seeds, phacelia, and some calendula; covered it all with a bit of mulch. The next day, 40 mph winds blew it all away. So we shall see. Seriously, if I just took time to better define the pathways, it would make a world of difference. 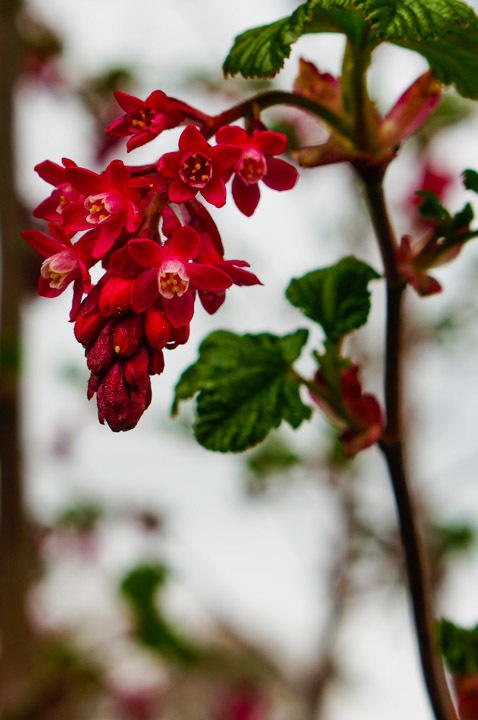 The Red Flowering Currants are so beautiful at this time of year! The other day, I was out on my morning walk-about, marveling at how all around me were hummingbirds and bumblebees and other little insects flying about, and I looked down near the ground, where just a foot away sat a little sparrow. She seemed to be enjoying the morning sun (perhaps a bit worn out from the windstorm the previous night?) and she just sat there, blinking up at me, and occasionally preening. I stood there a long time, sipping my coffee, before backing away. Wish I’d had my camera! Some of our native plants are very important because they are early blooming perennials, providing food (and shelter) when little else is available. I will be planting more of them. Magnolia Star, Magnolia stellata, is such a beautiful pure white flower with a blush of pink. This shrub almost glows in the dark. 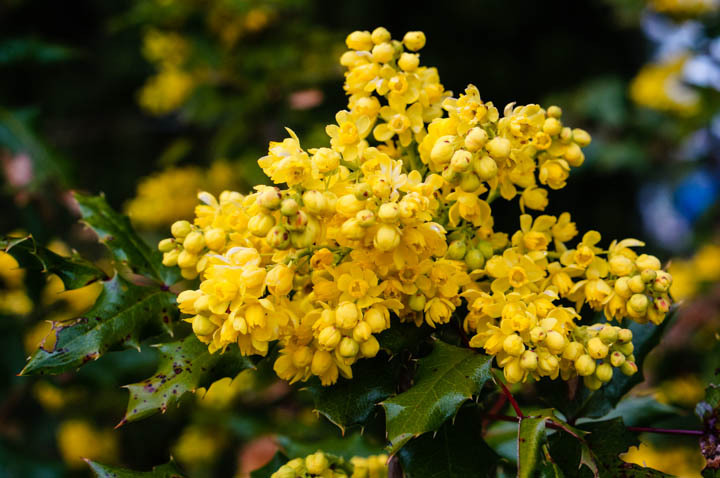 Oregon Grape, Mahonia aquifolium: The little pollinators are all over this. Love this bright yellow near the red flowering currants! 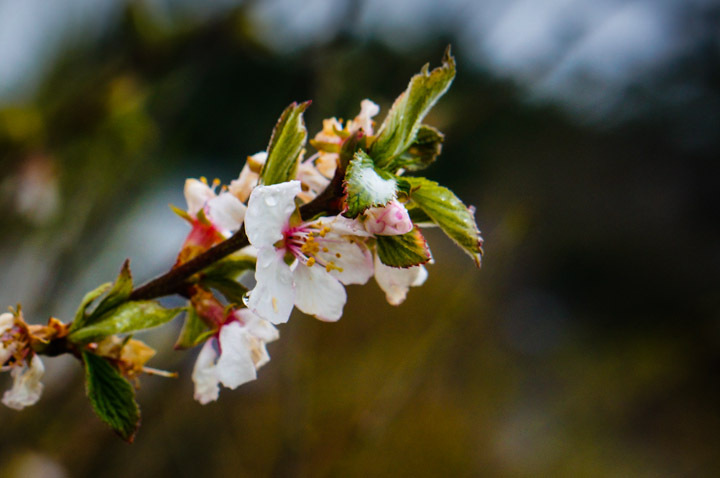 Nanking Cherry, Prunus tomentosa: These bloom so early and are like the breath of spring! I thought I had lost them. 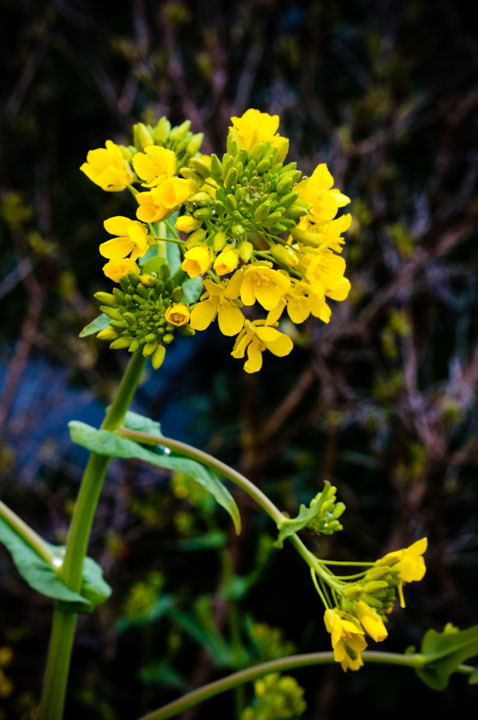 Wild mustard? Feral turnip? These came up in the compost. I leave them for now for the bees. 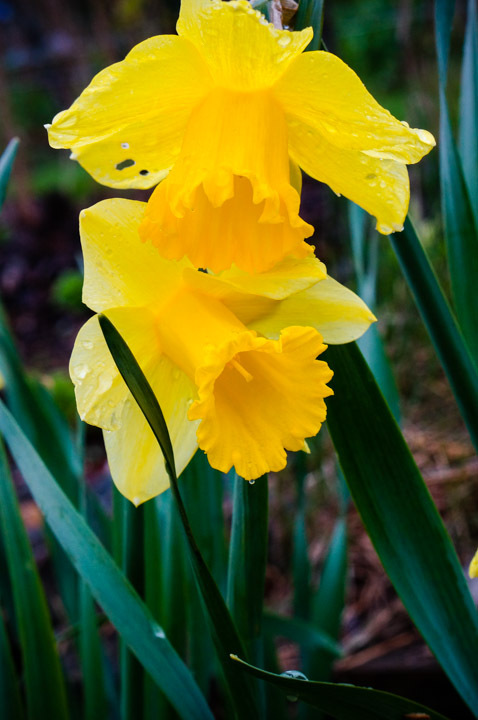 Daffodils: I would plant them for no other reason than that they make me happy. 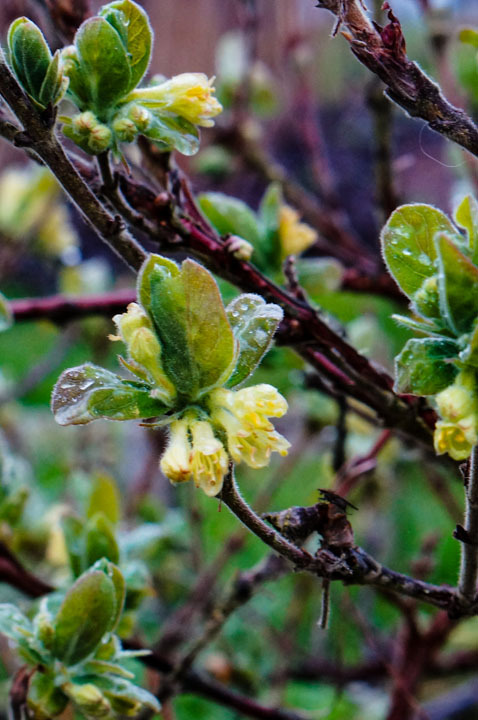 Honeyberry blossoms, Lonicera cecerulea edulis: This early bloomer will bring wonderful blue berries around June. I will definitely plant more of these. 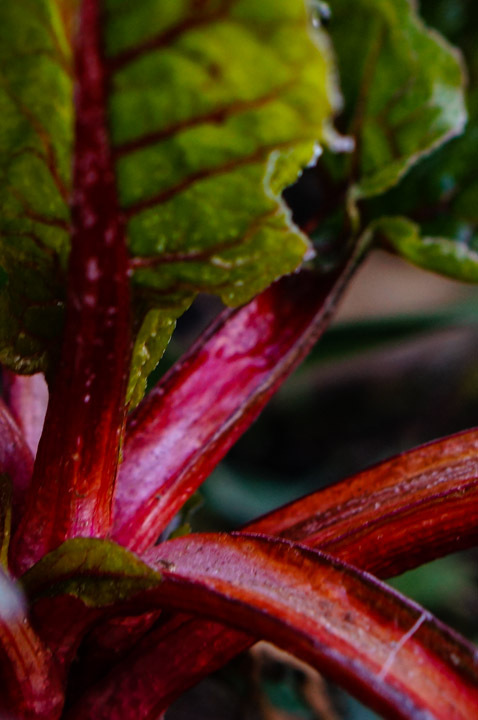 April Garden Survey: What Else is UP? 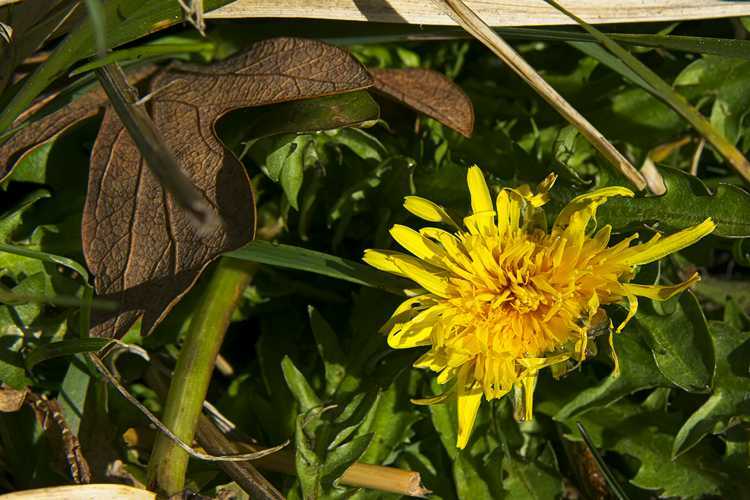 Need we mention chickweed, nettles, and dandelions – and all those other great spring greens that replenish our winter-anemic bodies with vitamins, minerals, and fresh-earth vibrancy? Yes, it is foraging season! We will be out collecting, for sure! 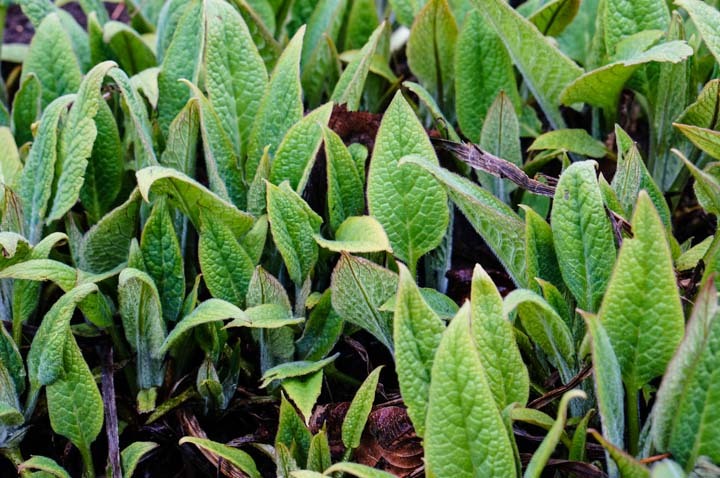 Comfrey (Symphytum x uplandicum) is up! Hooray! A great bee plant, medicinal plant, and mulch provider. 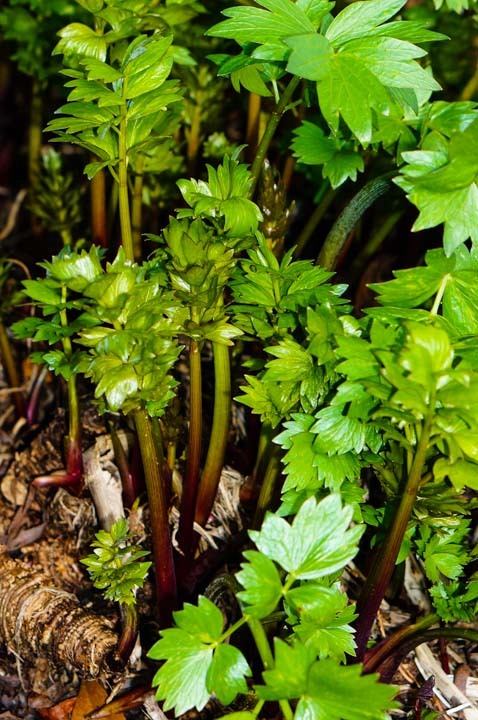 Lovage, Levisticum officinale, has a strong celery flavor, but is great when it is young. And I love the "lovage forest" that it makes. 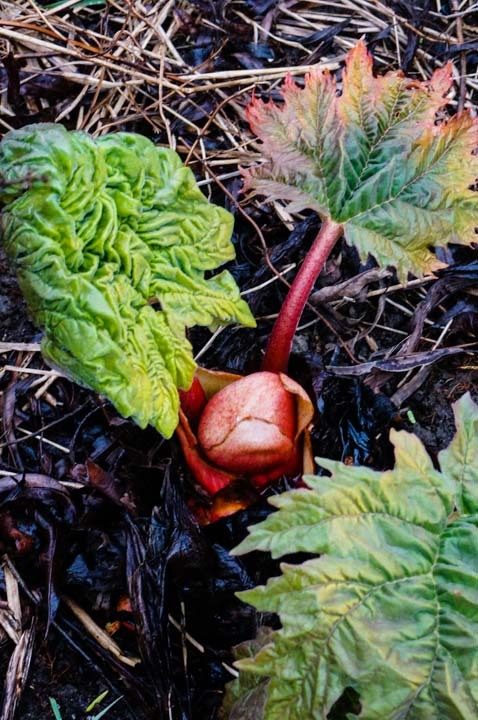 Over-wintered chard is a reliable standby in early spring. And who can resist that beautiful red! 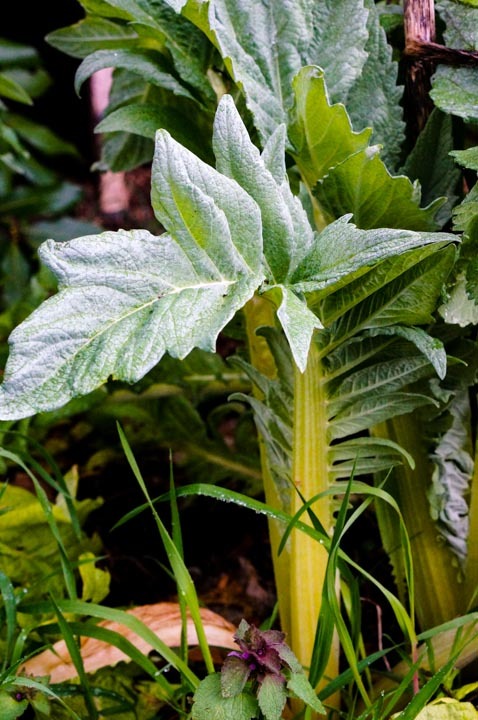 Cardoon, Cynara cardunculus: I mostly grow this for the blooms, which look like giant artichokes. The bumblebees love them. 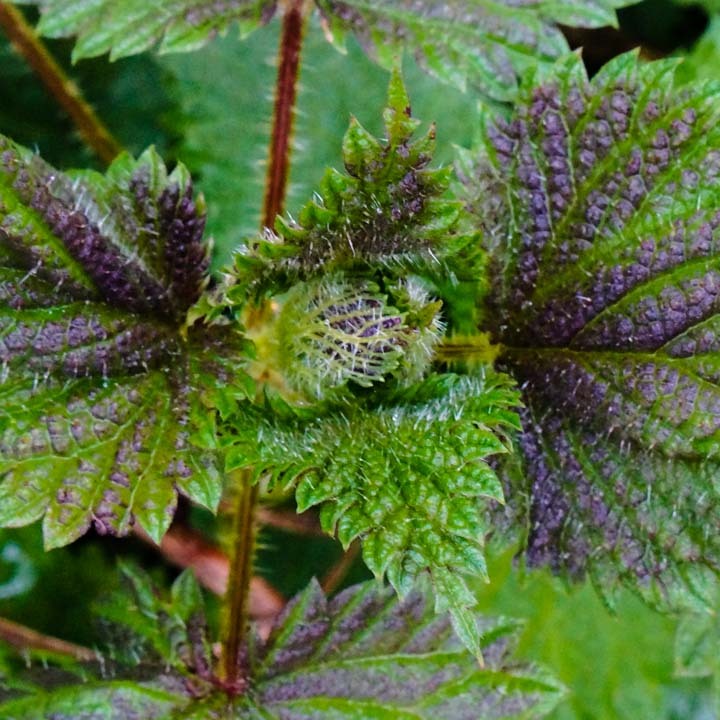 The early stems are edible. Ok, that’s all for now, folks, except for maybe a couple of recipes I came across and would like to try (below). 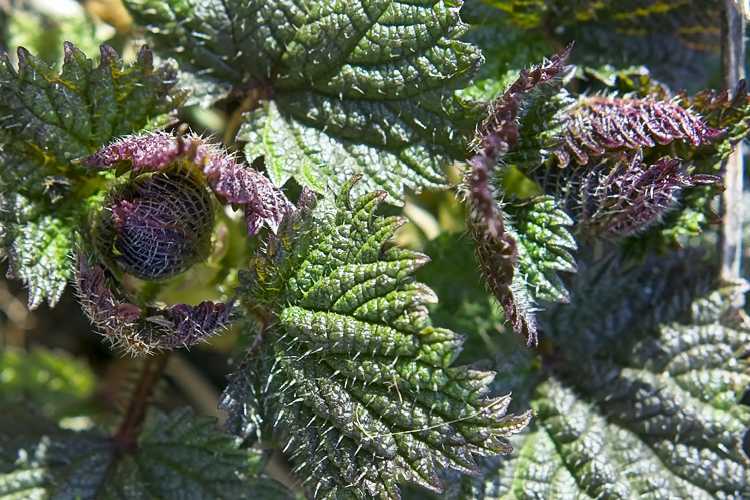 I think it’s ok to have a cup of spring tea – maybe something nourishing and energizing, like nettles, chickweed, and fir buds – or maybe something simple and relaxing, like a little fresh mint. Do we have to jump right up and get everything done? No… it’s ok to do a little walk-about and take a garden survey first. Wild Spring Green Tabouli: Super Nutritious & Super Delicious– a great recipe using foraged greens from Gather Victoria, one of my favorite websites. Why, Thank You, Susan – that means a lot. Hope all is well out on the west end. I love following your photos. Inspirational!